We offer a wide range of services and support to help improve the health and wellbeing and quality of life of all older people living in our city. To promote the well being of all older people and to help make later life a fulfilling and enjoyable experience. We are committed to ensuring that all our service users, staff, volunteers and partners are treated with dignity, respect and courtesy at all times. Our approach is holistic, person-centered and non-judgmental. We aim to deliver our services in a professional, confidential and efficient way and in partnership with other organisations and agencies to ensure individual needs are met. 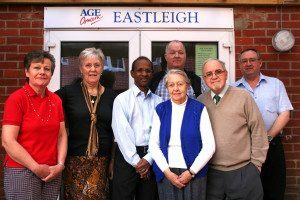 To provide support and services to all older people, and those who care for them, living in Eastleigh town and surrounding areas. To reduce isolation, poverty and health inequalities. To promote positive ageing and independence by encouraging and supporting active and healthy lifestyles. To inform people of their rights and choices.